Student of the Week: Christina King! This week we would like to recognize Christina King as our student of the week! This is Christina’s second year participating in the Foster-Schmidt Academy for Down Syndrome. Christina always comes to class ready to dance with lots of energy. She continues to improve week after week, and we are very proud of her! Congratulations, Christina! What school do you go to? When did you start dancing and in what class? 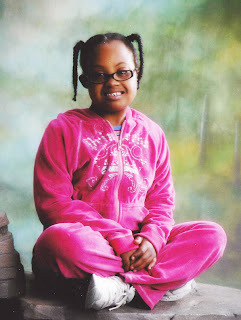 I started dancing at ADC last year in the 8-17 year old class for youth with Down syndrome. What is your favorite thing about dance? What do you do besides dance? I like to sing, choreograph, and play with my cat, Midnight. Why do you love dancing? I love music and I love to move to the beat. Previous Post: « Student of the Week: Hadley Collier! Congraulation Ms. C, you look good, you deserve to be the dancer of the week I am very very proud of you, and I love you very much, continue to do your vey best and nothing but great things will happen for you, I love that dress it looks great on you, again I am very proud of you. Way to go Christina!!! You are so cute and your outfit is gorgeous!! Your smile is just like your mom’s and you just keep up the good work. When you become famous I can say, “I know that beautiful young lady!” Take care and keep going! !